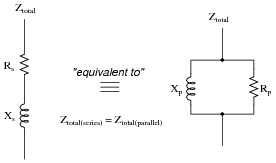 Demonstrate how algebra is used to derive the ten öther" forms of the two Ohm's Law / Joule's Law equations shown here. 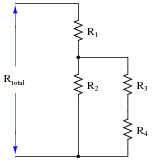 The sub-expression d2 - f2 appears twice in this equation. Wouldn't it be nice if we had something simpler to put in its place during the time we were busy manipulating the equation, if for no other reason than to have less variables to write on our paper while showing all the steps to our work? Well, we can do this! Substitute the variable x for the sub-expression d2 - f2, and then solve for c. When you are done manipulating the equation, back-substitute d2 - f2 in place of x. In other words, you need to have as your answer a single equation that begins with "I = " and has all the variables V, R1, R2, and R3 on the other side of the ëqual" sign. I like to speak of the process of substitution in terms of definitions for variables. In this particular case, R1 + R2 + R3 is a definition for R that we put in R's place in the first equation (I = V/R). 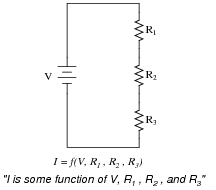 How is this formula similar, and how is it different, from the "voltage divider" formula? Though this "current divider formula" may be found in any number of electronics reference books, your students need to understand how to algebraically manipulate the given formulae to arrive at this one. Suppose we only knew the emitter and base currents for an operating transistor and wished to calculate b from that information. We would need a definition of beta cast in terms of IE and IB instead of IC and IB. Combined these two formulae into one solving for the resistance of a copper wire sample (RT) at a specific temperature in degrees Celsius (TC), given the specimen's "reference" resistance (Ro) at 20o Celsius (room temperature). Solving this algebraic problem requires both manipulation of the temperature equation and substitution of variables. One important detail I incorporated into this question is the lack of a subscript for T in the original resistance formula. In the first sentence I identify that temperature as being in degrees Celsius, but since there is no other T variables in the equation, I did not have to include a "C" subscript. When students look to the Celsius-Fahrenheit conversion formula to substitute into the resistance formula, they must decide which T in the conversion formula to use, TF or TC. Here, I purposely wrote the conversion formula in terms of TF to see how many students would blindly substitute TF for T in the resistance formula instead of properly identifying TC as the variable to substitute and doing the work of manipulation. Far from being a "trick" question, this scenario is very realistic. Formulae found in reference manuals do not necessarily use standardized variables, but rather cast their variables according to context. Multiple formulae will most likely not be written with identical subscripted variables just waiting to be substituted. It is the domain of the intelligent technician, engineer, or scientist to figure out what variables are appropriate to substitute based on context! Apply algebraic substitution to this formula so that alpha is defined as a function of beta: a = f(b). In other words, substitute and manipulate this equation until you have alpha by itself on one side and no variable except beta on the other. Follow-up question: what range of values might you expect for a, with a typical transistor?